Where is sign up form? So trying to get 5% more bookings and the potential complexities/problems of 50 more little sites? If you are on BringFido, aren't they likely also to select the Pet friendly places on the major OTAs? Doesn't the LGBQT market really strongly use the major OTAs more than MisterBnB? You are already getting a lot of the specialty market in the big OTAs. Besides, some of those small sites (like BedAndBreakfast.com) will probably be absorbed anyway. I would only really be interested in additional things like PPC type ads or Social Media campaigns that bring people to my site without introducing breakable functionality between me and the customer. We don't have a signup form. We'll be announcing additional channels directly. The direct channel integrations already in place are able to be connected if you have a channel (eg. Booking.com, CanadaStays, TripAdvisor) account in place. Go to Settings > Channels > Connect to get started. TripAdvisor is in active development right now and will be over the next couple months. Content/rate/availability/rule pushing is out and working. The booking part is in active development. That will get you connected. Keep in mind that TripAdvisor must approve you first as a "PM" and convert your account over. Look at the Instructions tab after creating the channel and follow what it says. I am on pay per book with Tripadvsior, will it follow the settings set on OR or will Ta settings prevail (i.e per cent of down payment) etc. We push all rules, rates and content for the listing. So the payment schedule (eg. 50% due up front, rest 45 days before arrival) is one of the things we push across. The TA channel settings in OR have some of these things broken out on the channel settings area. The rest come from the property data under the property menu. There are some channel-specific things (house rules, cancellation policy) that are unique to the channel, so those things are on the channel settings. By "TripAdvisor", does that include Flipkey , etc? Yes. TripAdvisor Rentals and FlipKey are the same thing now. If you have a listing on TA Rentals, it will show on FlipKey and their other family of sites. They merged all that a couple years ago and now it's the same account. Basically, you need to follow our instructions in contacting them and saying you want to be use OwnerRez as a channel manager and then TA will convert you over to a new type of account (your reviews will be preserved) and give you a new Account ID to use. After connecting the TA channel in OwnerRez, read the instructions tab. saw announcement, but where is the "sign up" to have 1st year for a $1/mo? Channel integration is great but with missing out on full integration with all the majors (ie VRBO and Airbnb) and the fact that this is new and not fully integrated, I'm going to wait. When you have full flawless integration with all the majors, I'll def be signing up. That's great news. I love everything that Owner Rez has to offer. It always feels very turn key compared to other solutions and they know exactly what we need before we do ourselves. I've tested the Beta version of the Channel Management and it's already more polished than many of the"established" Channel Managers out there (I've tested a few). @BlueMtn: To sign up for Channels, go to the Billing section in the dropdown menu in the top-right. 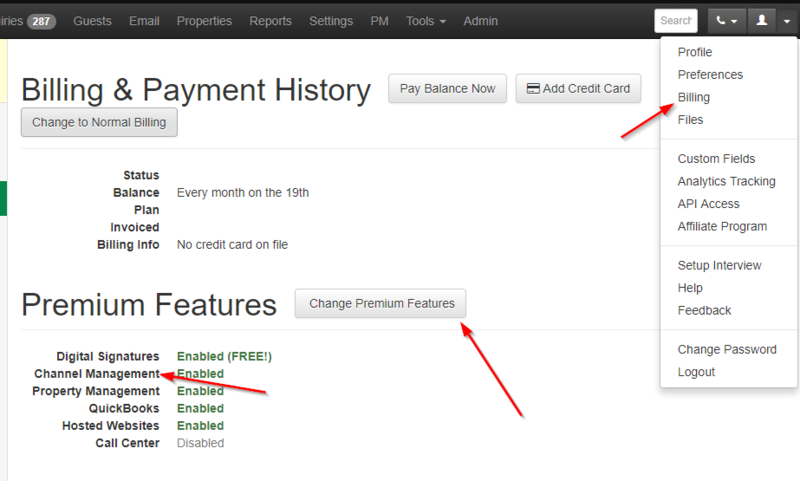 Hit "Change Premium Features" and turn on "Channel Management". We'll do a sweep of everybody that has channels enabled at the end of November and then apply the discount that way. @Bennett: We're hard at work on knocking out those channels! 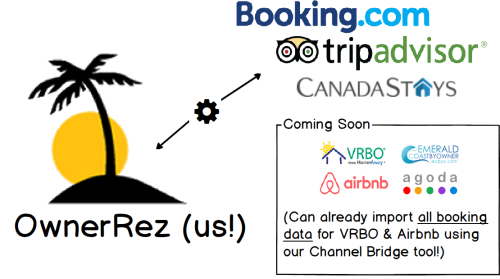 VRBO should be in around the end of the year, with Airbnb to follow shortly. @Maged: Thanks for the kind words! We spend a lot of time to try and simplify and standardize these channels... glad everything is working smoothly for you! Okay, I signed up... Now how do I turn on each integration? Each one is different, and there are instructions in each channel as you add it, as well as links to step by step articles. If you run into a particular snag, shoot us an email at help@ownerreservations.com and we'll get you sorted. When you get the integration setup for VRBO users is there going to be an offer for the $1 per month for the first year. I am only on my own site and the VRBO site so there is no need for me to sign up now. The VRBO API based integration will require 5+ properties -- that's their minimum for hooking up an account, unfortunately. I used channel bridge to push rates to VRBO. Says successful, but so far I do not see updated rates on VRBO? Or is there a time lag? The rate push only goes to their nightly rate model (not the old seasonal rates). Which are you on? Also make sure you're on the latest version: https://www.ownerreservations.com/support/articles/updating-channel-bridge-to-latest-version -- we just pushed up a fix today where an older version was setting a 14% weekly discount -- now it only pushes rates, not the weekly discount. ugh, you responded to a question I had recently, but I do not remember how to search the forums themselves. Previously, I asked about combining my VRs, both on my hosted website and on the OTAs. for example, I have two 5-bedroom (attached to each other) townhomes. I would like to offer them both together as well as a single 10 bedroom VR. I would do the commission model on HA/VRBO. On the channels and channel bridge, how would it handle having (lets call these) Property A, Property B, and Property "A+B"? You would have listings on VRBO and Airbnb for the same thing. Property A might be "The Green Room at Luxury Villa" where Property ABC is "The entire Luxury Villa". Do you intend to add Expedia to the channel manager? You'll be able to distribute to Expedia through our HomeAway integration. We're planning on direct Expedia integration eventually, but that's a good deal farther out.